Neal Crowley, the brother who stayed on to make a life for himself near Thunder Butte, was appointed Chief of Police of the town of Faith, South Dakota. The police force in Faith never was much more than a one or two man affair, but it was sometimes vital. When violence or other calamity hits a small town, it is the sheriff, or in this case--the small police force--that is called in to handle things. On the rare occasions when I saw Neal as a child, he would dissemble about the importance of the job, saying that mainly he dealt with the occasional trucker or person off of the nearby reservation who stopped in town and had a little bit too much to drink. Neal was a big man, and no doubt that came in handy in dealing with these kinds of situations. But, Neal also had a friendly and garrulous manner, and could deal well with most folks. So, he downplayed the times when it was necessary to resort to physical force in dealing with people when they got unpleasant. People who live around Faith have gotten used to occasional droughts and hard winters, and the effects they have on the nearby farms and ranches. Sometimes, though, things get out of hand as they did during January of 1949. That month, a severe blizzard struck western South Dakota, burying roads and cattle, stranding people in their homes, and cutting off the area from the outside world. On January 28, 1949, the Nebraska State Journal reported that "more than 100 bulldozers started clearing paths to starving cattle in the storm-stricken area of western South Dakota. Thursday." The paper quoted Police Chief Neal Crowley at Faith as telling the Rapid City Journal that many ranchers in that area are "completely wiped out." With the roads closed, there were some food and hay drops by airplane. Still, without modern snow removal equipment, many people in the area were stranded for weeks or months, and many cattle were lost. The experience of being cut off from the rest of the world in the aftermath of the blizzard of 1949 may have been a turning point for Neal and the town of Faith. After all, Faith was 105 miles east of the Meade County seat in Sturgis, and 123 miles northeast of the nearest city of any real size--Rapid City, South Dakota. In any case, people started agitating for the county to place a deputy sheriff in Faith so that if assistance was needed, it would not take a couple of hours on a clear highway and days or weeks under snowbound conditions to get some help. 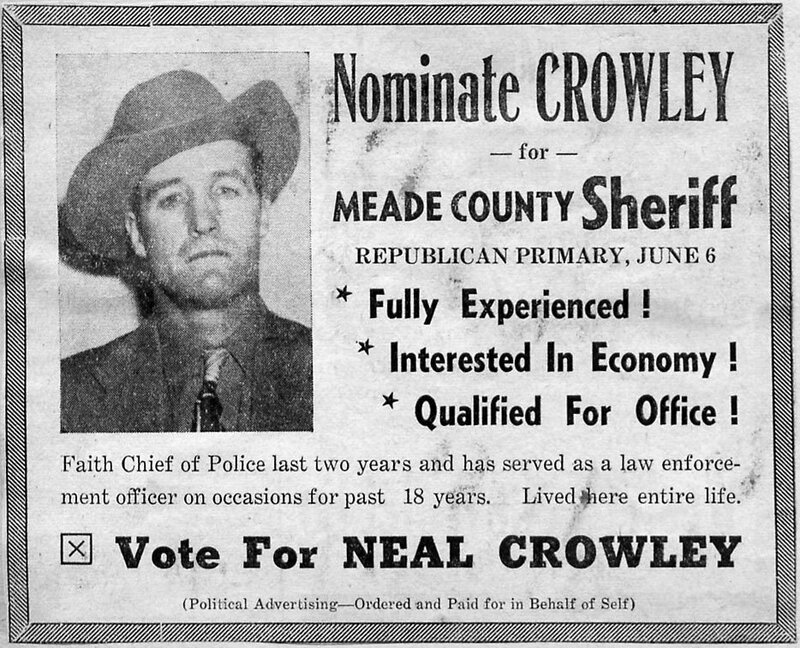 In 1950, Neal announced his intention to run in the June 6th Republican primary for Meade County Sheriff. According to a local news report, "He feels that placing a deputy in Faith would go a long ways toward cutting down mileage and undue expense to the sheriff's office, and if nominated and elected in the fall, economy and unbiased service to the citizens of Meade County would be his chief aim. 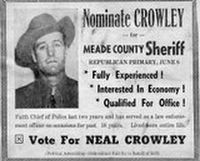 While Neal did not win the election, in January 1951, Meade County Sheriff Carl Aga magnanimously named Neal a Meade County deputy sheriff responsible for law enforcement duties in the western part of the county in and around Faith. In addition to his law enforcement duties, Neal and his wife, Dorothy, also adopted two children--a boy and a girl--and settled into a family life in Faith. In addition to variously serving as Chief of Police and Deputy Sheriff, Neal also managed Faith's municipal bar and liquor store for a time. Neal found other ways to augment his income, too, by obtaining and running a couple of mail routes and subletting others. Faith still has a small police department, which can be visited online here. The current Police Chief, Arlen (Hoss) Frankfurth--who has held the office since 1989--told me by email in February 2005 that "I have heard a lot about your uncle from the old timers in town...." Neal was the Chief of Police about the time that Chief Frankfurth was born. Thunder Butte has meant different things to different people through the years. A sacred mountain to the Lakota for ages, some white settlers around the turn of the last century also looked to the butte as a thing of stunning beauty and majesty. The following poem was written by G. M. Drummond, who was appointed Ziebach County Superintendent of Schools in 1912. A long time resident of the area, Mr. Drummond passed away in Selby, South Dakota in 1973. With a diadem of stone! Or by the Winter snow. That may be seen afar. Editor's Note—This poem can be found in, “South Dakota's Ziebach County, History of the Prairie” published in 1982 by the Ziebach County Historical Society in Dupree, SD.